Well, the newborn hat is finished! The funny thing is that I could have finished it ages ago. I’m such a beginner at knitting that I read, “use a 3 needle bind off to close the top of the hat with right sides together,” in the instructions for the Pixy Newborn Hat and thought it meant I needed to use a size 3 needle. And, with everything that’s going on right now in preparation for the little one’s impending arrival, I just wasn’t making the time to go out and buy size 3 knitting needles. Finally, I thought I’d just google “3 needle bind off” to at least see what the method was in the hopes that I might finally get motivated enough to finish the hat. And, of course, I found out that the three-needle bind off is the name of a technique that uses three needles, not size 3 needles. So, this whole time I’ve had everything I’ve needed to finish this little hat, only I didn’t realize it! All that was left was to weave in the loose end, and I’ll admit I just made up how to do it at the time. In the future I promise to look up how to properly weave in the end! Finally, I used a crochet needle to add a few extra long strands at the top corners, which I braided to approximately the same length and tied off with a few extra pieces of yarn for tassels. One thing I was wondering – instead of weaving in the loose end from the body of knitting, could I have just worked the end into one of the braided tassels? And, with that, I can proudly show off my first finished knitting project! This little hat is also my first finished project of 2014. Who would have thought my first finished project of 2014 would be knitting?! Aw, that’s so cute!! You’ll have a matching baby soon enough 🙂 You could have added that end to the braid, I love it when something like that happens and I don’t have to weave the end in. I’ve had whole knitting projects sit around for days because I couldn’t get the motivation to weave in the ends! Oooh! Good to know about the loose end. I thought it could work, but I didn’t want to deviate from instructions on my first knitting project for fear that everything would unravel as soon as I started trying to use the little hat! Well, I mean pull the loose end through the loop to knot, then weave or do whatever with the end. That’s what I do anyway, and it seems to work. I’m no knitting expert though! CUTE!!!! I love the wee little antennae! Great job, that is so cute! That is adorable even without a cute baby inside. If you can do a 3 needle bind off you are no longer a beginning knitter! Wow! That’s good to know. I definitely still feel like there’s so much more to learn that I’m better off still classifying myself as a beginner though! That hat is adorable and I’m sure will be even more so with a baby head in it! It’s so hard to be patient, but baby will arrive soon enough — you really won’t be pregnant forever! Too cute! Congrats on your first project! It’s so adorable! =) I can’t wait to see pictures of your baby wearing it. Thank you! And, good to know. I have so much to learn about little ones! I’ll start digging through scraps this weekend! So adorable! Your little one will be here soon to model it! If you make another hat, I’ve found cotton yarn to work really well, as it is comfortable and soft to wear. It seems like babies come in waves, and for a while there, I was churning out a bunch of newborn caps! Awww, this is so cute! I love it! Love those jaunty tassels! You’re in the home stretch…. Oh, how funny, Amy! 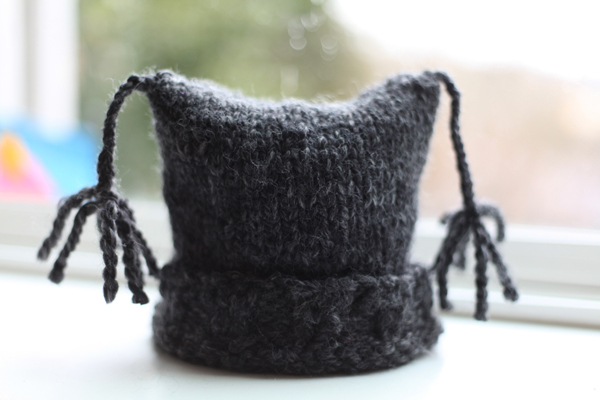 A cute baby hat and a great first project – no shaping involved! I love this hat! I posted it on my Confident Stitch Facebook page. Your baby will be so well-dressed!